So here's the situation: my KNK Zing is set up and running with my Windows PC. But I can't get my MacBook Pro, macOS High Sierra 10.13.2, to recognize the Zing under the MTC COM Bridge app. 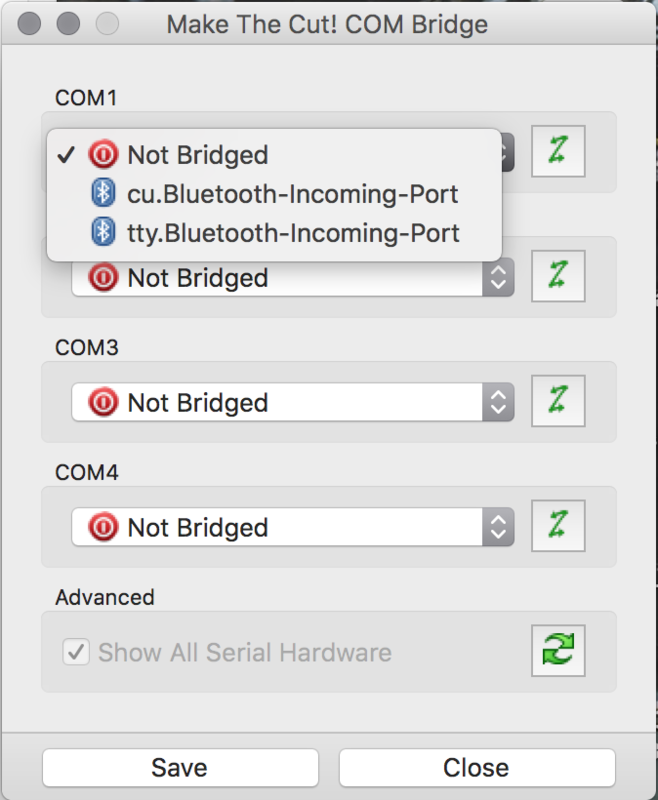 I've followed all the steps including installing the FTDI driver and my MacBook recognizes when the Zing is plugged in as FT232R USB UART, but MTC COM Bridge app can't find it. I will look into this tomorrow morning with my Zing and MacBook. I tested this morning and it worked just fine for me. I have 10.13.4 installed and after hooking up the Zing with a USB, I opened the Bridge and the connection in the menu under COM1. I selected it and then clicked on Save. How far can you get? Do you see anything under COM 1? Immediately after opening Bridge I get an error message saying Unable to find any devices connected, despite the Zing being plugged in, turned on, and recognized in System Information. Hitting retry just brings the same message and under COM1 are only bluetooth options. I've even uninstalled everything using AppCleaner and reinstalled following all the steps but the Bridge app still does not recognize the Zing. Don't you have to tell the iOS to allow non-Apple approved applications? Which means the OP has done that I would think or MTC its self would not work. Unfortunately, my advice would be to uninstall and reinstall but the OP says he has done that with the AppCleaner. I do know that sometimes it can be finicky and you have to do it more than once sometimes (sometimes several according to some old posts I recall seeing.) So, if you have only done it once or twice may need to try again. I don't have a Zing and don't regularly use my Mac with my cutter so I haven't messed with it in a long time so no real help thatI can provide beyond that I am afraid. @leslie6111 I think uses hers with her Mac but I haven't seen her on the forum in a while and I think she was moving from TX to the Eastern Area of US so not sure if she is in that process or not. If you can't get it to work, you might log a support ticket on the KNK Support site and see if someone at KNK can help you work it out. The MTC Support ticket system was having issues last I knew. At the top will be a list. The one you're looking for should say something like "FT232R USB UART". This will tell you is your Mac has connected your Zing using the correct driver. Select it and then, in the lower window it should say the Vendor and Manufacturer are FTDI. If you do not see it listed, then try a different USB cable and/or a different USB port. Hey @SandyMcC , as I explained in my very first post here, I have already verified that my Mac can recognize the Zing, with the proper driver, using System Information. @MeFlick , I'll submit a support ticket with KNK and try running through the whole process again, thanks! I'm sorry that I didn't go back and read your first post. My bad. I don't understand it since I was able to update without any issues at all. Doesn't make any sense. Disconnect the Zing from your Mac. Go to the following link and scroll down to the table. Even though you are on High Sierra, do the D2XX helper mentioned in the Comments column. Then download the 1.4.4 driver and run it. Reboot your Mac and connect your Zing again. Open the Bridge program and see if the tty listing is there again. Hey @SandyMcC, thanks for the update! I tried your suggestion but I'm still having issues getting Bridge to connect. Do you know of any alternative (free) programs that will work with the Zing? MTC Bridge refuses to recognize the Zing on my Mac and while my PC works, it's a pain for my workflow. To my knowledge, there are no free programs that work with the Zing or other cutters. (Edited to add: maybe Inkscape based on Sandy jogging my memory). Not sure what the problem is with your MTC and Com Bridge connecting on your Mac unfortunately. However, I have never seen this happen where it couldn't eventually be made to work. If you want to use your Mac and only your Mac with the Zing - then you may need to work with SCAL (which I saw in another thread you purchased already) to do so. At least for now, until you can get MTC and the Comm bridge issue sorted out. May not be the news you want to hear, but may allow you to put your frustrations to rest right now and get back to work with your cutter. I assume that your "pain" with your workflow is that your Mac is in the room with your Zing cutter and the PC is not? I have the opposite setup. I have the PC in the room with my cutter and use it rather than my Mac when cutting. I can work on my Mac in MTC if I choose, then send the file to my PC via various methods to actually cut with. However, that is one of the reasons that have mine setup that way. Only you can decide what setup is best for you. Inkscape might. I've not tested the cutter plugins on the Mac version. Plus, I don't believe the Inkscape version can do print and cuts. But the PC version does do regular cutting to the Zing and I verified that once a number of years ago. You can download the Mac verson of Inkscape from inkscape.org to test it out. Personally, I think it makes more sense to get SCAL, even though it costs $60. It has a true Mac version and you can test the trial for 15 days before buying. It does do watermark cuts but at least you'll get a sense of whether or not it's worth it. I just checked Inkscape on my Mac. Here's how you access the cutting window: Go to Extensions>Export>Plot. Then, under the Connection Settings, change Command Language option to KNK Zing (HPGL variant). Then set the Serial baud rate to 57600. And I have no clue what Flow Control setting to recommend. I guess just test them all. Then under Plotter Settings, you can set the Force and Speed. I don't know the scales that were used, so you'll need to just experiment. @MeFlick, actually the pain/inconvenience comes from the fact that my work heavily involves programming in Java and exporting the results to Illustrator before cutting, which I do on my laptop since I can carry it with me through the day. I only cut files when I get back home, and it's inconvenient to repeatedly transfer files every time I need to make a small adjustment. @SandyMcC ; I'll try out Inkscape, thanks for the suggestion. @Alien312 - have you tried using a cloud service like DropBox, or you iCloud account for your files? It would save the time and hassle of transferring files every time you make an adjustment because you would be doing it to the cloud version. @Liz_A, I have and the upload/download times take far longer than using a USB drive since the internet speeds in my area are so slow and the files I'm transferring tend to be large.